There's a 2016 version of this guide. This is an archived post from 2015. 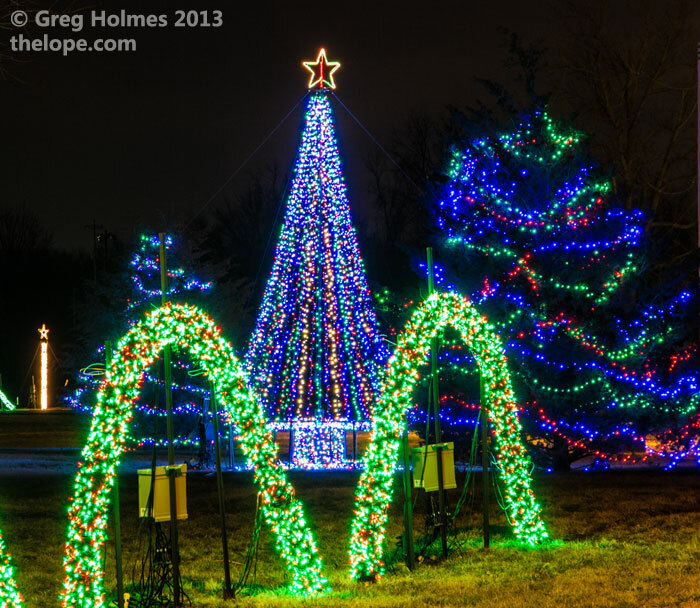 Last updated December 21, 2015 - here are some of the Christmas lights of Webb City; some pictures were shot in 2014 but I have checked all sites to see if they're up in 2015. 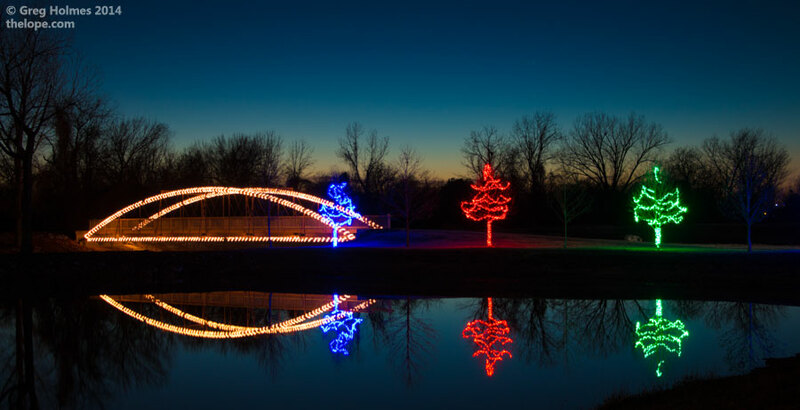 Webb City's 144 acre King Jack Park usually becomes a huge drive-through attraction in the Christmas season with many animated light displays. However, road construction this year has limited most of that. This large tree is up, though. 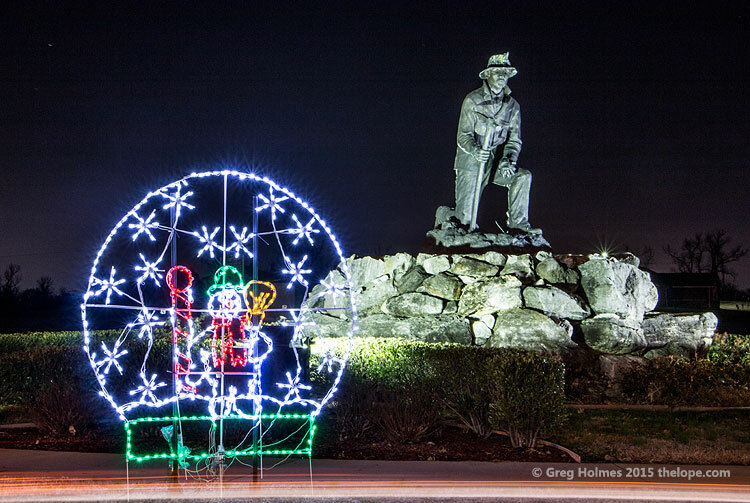 The miner has been joined by an animated light display of a snow globe. 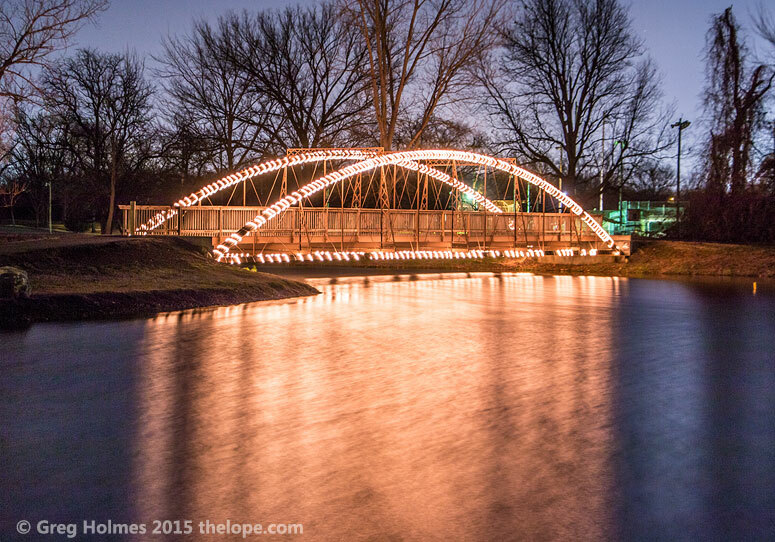 The metal walking bridge in the park is decked out in lights. 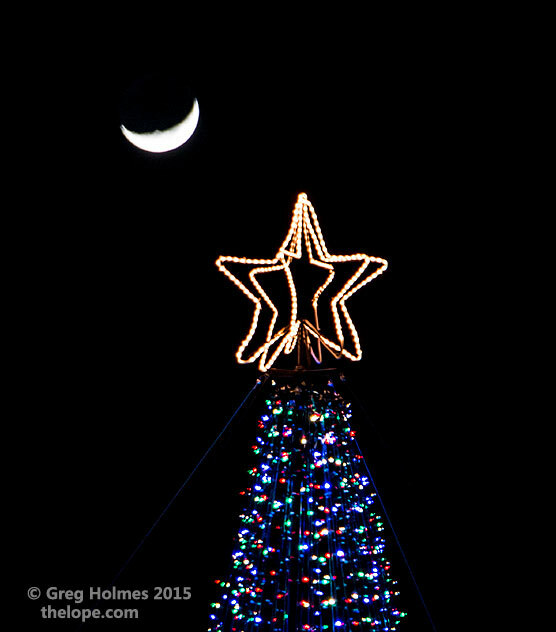 Unlike last year, the trees around it are not lit. From the Webb City website: "At one time the Georgia City Bridge was the oldest extant all-metal vehicular bridge in the state of Missouri. Built in 1871, it is a one span, bowstring arch truss bridge." 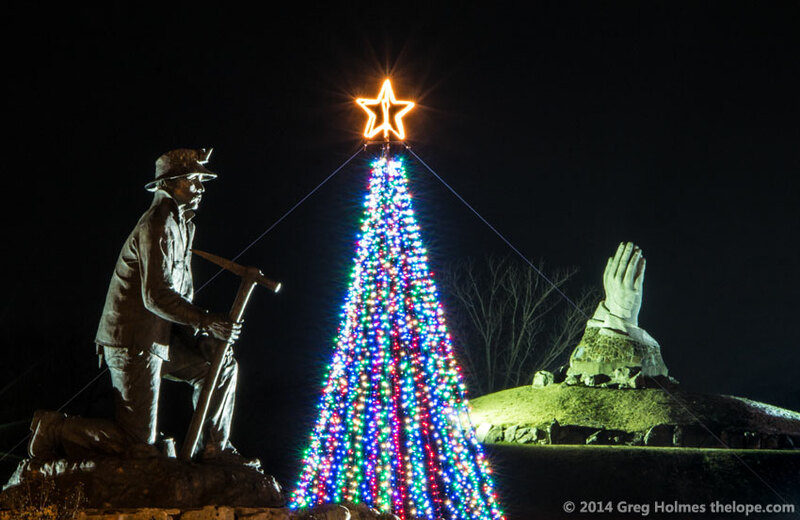 This residence at the NW corner of the park is decorated for 2015, just as it was in this 2014 picture. The Webb City high school mascot is a cardinal, as seen in this flock of same that has been in place downtown for at least the last six Christmas seasons. It's up and running in 2015 as well. 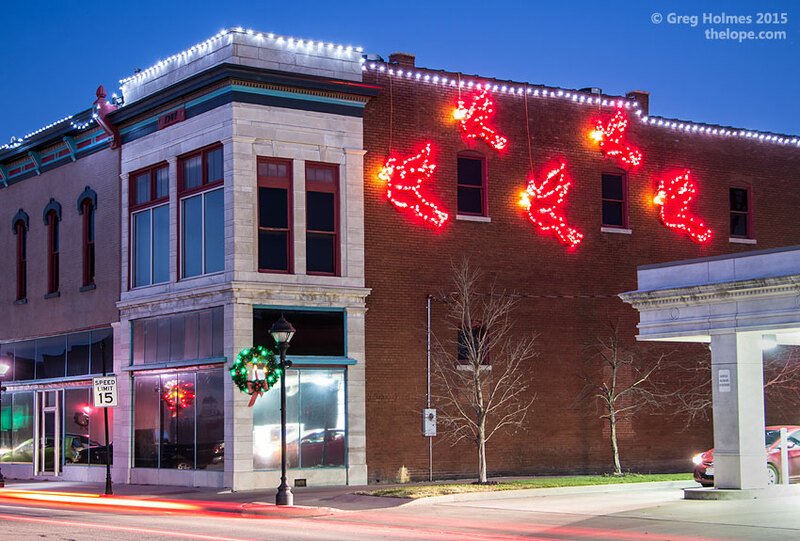 Webb City uses wreaths with electric candles downtown on its lamp posts and alternates the colors of red and green. 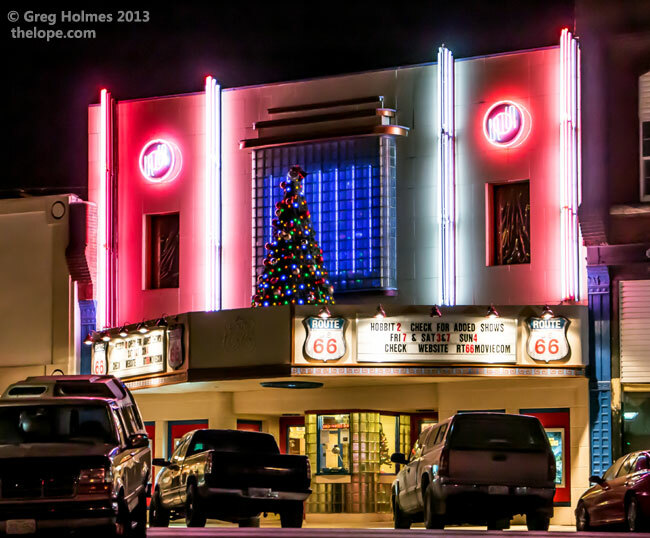 While not strictly speaking a Christmas attraction, the Route 66 Movie Theatre is often decked out for the holiday and shows Christmas movies. This year (2015) it does not have a Christmas tree atop the marquis. 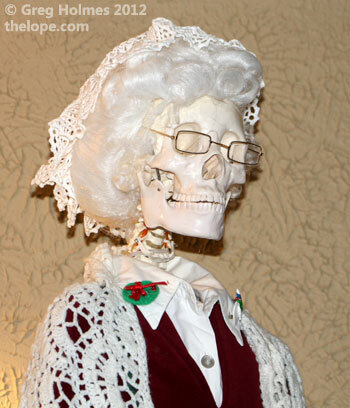 The Burpo chiropractic office at 26 South Main features skeletons in the window display dressed for various holidays. This Christmas is no exception. Mrs. Claus is not left out. Barely in Webb City and just across from the SW corner of the Joplin airport are two homes with novel decorations. This one at 25 Colonial Drive outlines its architecture, uses dripping lights in vertical windows and a Gemmy Industries life-size Santa. It looks exactly like this in 2015. Just north of the above home on S Colonial Drive, neighbors wrapped columns and tree trunks, framing "Joy." Last year they placed shooting stars in the trees. Back in 2015 after an absence last year is this fine set of decorations on South Webb Avenue. The house is not quite as decked out in 2015 as it is in this 2010 picture but they still seem to be adding to it. Many of these decorations look commercial in origin. Here's the house as of December 19, 2015. 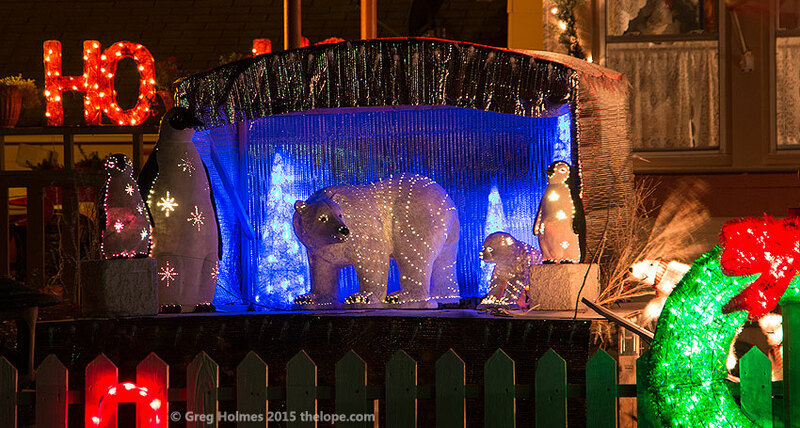 A detail from the lawn this year shows the owner's use of store window display styling and deeply saturated colors. Another noteworthy home is at 329 S. Oronogo on the NE corner of W. 4th and S. Oronogo. 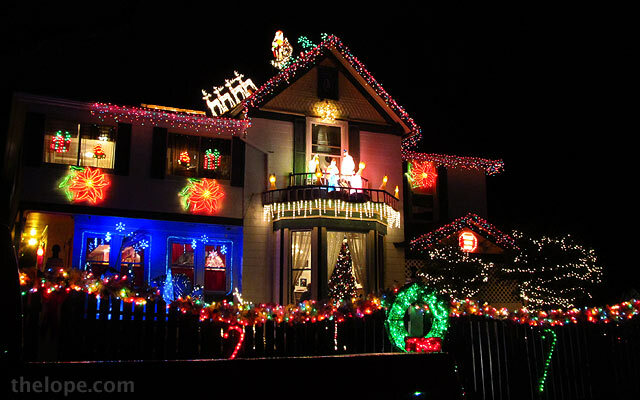 They've used this style for several years and sometimes their immediate neighbors decorate as well. Here it is in 2015. 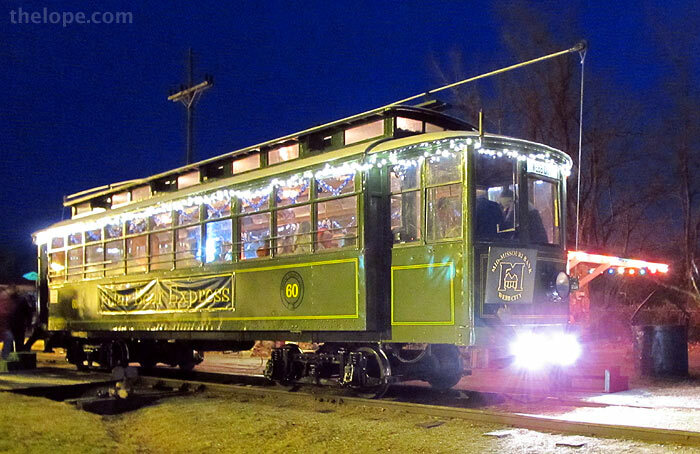 Absent for 2015 in Webb City is any sort of street car. In recent years the city ran a restored street car on track within King Jack Park as their "Polar Bear Express." In 2014 a restored trolley (on tires) seemed to serve this function. See more of the #60 street car here.